David Hancock. 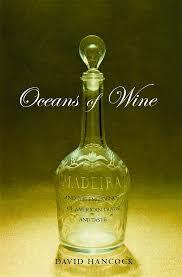 Oceans of Wine: Madeira and the Emergence of American Trade and Taste. Yale University Press, 2009. As the author of a book called Mountains of Debt I am predisposed to like a book called Oceans of Wine based on the title alone. In fact, it is a masterpiece. I wish I knew as much about anything as David Hancock clearly knows about the Madeira wine trade between 1640 and 1815. This serious social and economic history is filled with interesting facts, detailed analysis and thoughtful insights. What a delight! Madeira was America’s wine in the 18th century, when we were a wine-drinking country but before a domestic industry had taken root. Wines from this small island found their way into shops, taverns and cellars throughout America, one element among many in what this book reveals to be a surprisingly complex network of trade connections that supported an unexpectedly cosmopolitan consumption culture. Wine exports became a trade necessity when Madeira lost its comparative advantage in sugar production in the 17th Century and, unlikely as it may seem, its wines soon dominated the Atlantic trade. Madeira could be found just about everywhere in America, from the cellars of wealthy families in big cities to humble country taverns and shops. Although it would be nice to be able to say that its great success was the result of a unique terroir, in fact Madeira wine evolved into a highly manipulated manufactured product, blended, fortified, heated, agitated and tailored to the preferences of specific consumer markets. It was, in short, everything that wine snobs today hate and fear about wine, but it was treasured and enjoyed by the societies that created it. Give up romantic notions of wine’s pure and glorious past all who enter here! The wine trade evolved, in Hancock’s deft telling of the story, through complex formal and informal networks where information was successfully exchanged via “conversations” between buyer and seller and between and among network members at each stage of the complex production and distribution process. If you think that the interactive, diffused global commodity chain of today is a new thing, you need to read this account of how the Madeira trade worked 300 years ago! Hancock is not content to simply paint a landscape of Madeira trade. He uses each link in the commodity chain (from Madeira viticulture all the way to American country tavern) as an opportunity to drill down into detailed (and generously illustrated) essays on the economic and social institutions of the time. The result is a work of remarkable scope and depth — a noteworthy accomplishment. This is a great book of economic and social history told through the wine trade. It is a serious book of history that offers many lessons. Like Madeira itself, it will give much pleasure to many audiences, including historians, wine drinkers and economists. Bravo! Note: Thanks for Francine Graf, my editor at CHOICE magazine, for suggesting this book.